Unstructured data is the new talk of the town! More than 80% of the world’s data is in this form, and big wigs of financial world need to confront the challenges of administering such volumes of unstructured data through in-house data consultants. FYI, deriving insights from unstructured data is an extremely tiresome and expensive process. Most buy-sides don’t have access to these types of data, hence big data vendors are the only resort. They are the ones who transform unstructured content into tradable market data. 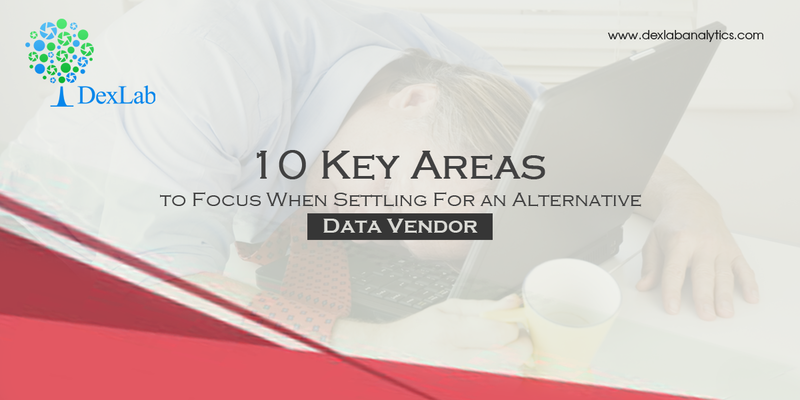 Here, we’ve narrowed down 10 key areas to focus while seeking an alternative data vendor. Banks and hedge funds should seek alternative data vendors that can efficiently process unstructured data into 100% machine readable structured format – irrespective of data form. Most of the alternative data providers are new kid in the block, thus have no formidable base of storing data. This makes accurate back-testing difficult. The science of alternative data is punctured with a lot of loopholes. Sometimes, the vendor fails to store data at the time of generation – and that becomes an issue. Transparency is very crucial to deal with data integrity issues so as to nudge consumers to come at informed conclusions about which part of data to use and not to use. While you look at unstructured content, like text, the NLP or natural language processing engine must be used to decode financial terminologies. As a result, vendors should create their own dictionary for industry related definitions. Each day, technology gets better or the production processes change; hence vendors must practice version control on their processes. Otherwise, future results will be surely different from back-testing performance. This generally means that your analysis includes data that is downright relevant and available at particular periods of time. In other cases, there exists a higher chance for advance bias being added in your results. Most of the alternative data don’t include financial securities in its scope. The users need to figure out how to relate this information with a tradable security, such as bonds and stocks. AI and alternative data analytics are dramatically changing. A lot of competition between companies urges them to stay up-to-date and innovative. In order to do so, some data vendors have pooled in a dedicated team of data scientists. It’s very important for both vendors and clients to know from where data is coming, and what exactly is its source to ensure it don’t violate any laws. Few vendors have very less or no research establishing the value of their data. In consequence, the vendor ends up burdening the customer to carry out early stage research from their part. In a nutshell, alternative data in finance refer to data sets that are obtained to inject insight into the investment process. Most hedge fund managers and deft investment professionals employ these data to derive timely insights fueling investment opportunities. Big data is a major chunk of alternative data sets. Now, if you want to arm yourself with a good big data hadoop certification in Gurgaon then walk into DexLab Analytics. They are the best analytics training institute in India.